Wow! How is it already the 4th? This year is flying by, haha! I have not posted my New Year Resolutions, shame on me. I am super excited for this year and what it will bring. I just know this is going to be the best year yet! I am in serious mode of wanting a farm. It makes me happy and always has. So a lot of my goals this year are geared towards this. Well as 2010 ends, all I can say is I am thankful. 2010 was very hard. 1. Post 5 to 7 blog posts a week. While I didn't complete this challenge there was a good reason. 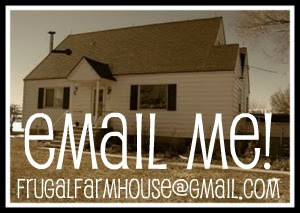 In midst of getting this blog up and running I became very caught up in the numbers... visitors, views projects I was completing.. and lost sight of what Frugal Farmhouse was suppose to be about. I took time off, re-centered my head and while I may not post as much as super bloggers... I am still here. 2. $5/person/week grocery challenge- succeeded until about July. Will be going back to our skimpy grocery budget so I am sure you will here more about this again. 3. Homestead skill a month challenge- This is my favorite resolution and have carried it over to this year. 1. How to make butter-nope..
3. Make homemade tortillas- yes and will continue to perfect these. 4. Hm laundry soap-yes and I love it!